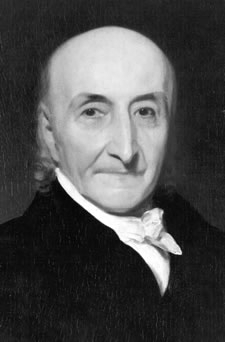 Albert Gallatin (1761 - 1849) was an American statesman and scholar who served as the United States Secretary of the Treasury from 1801 to 1814 under presidents Thomas Jefferson and James Madison. Expert in finance, Gallatin designed and implemented Jeffersonian Republican fiscal policies by lowering taxes, reducing the national debt, and financing both the Louisiana Purchase and the War of 1812. He later had a long diplomatic career. An accomplished linguist, Gallatin was one of the first to examine the languages of Native Americans and pioneered anthropology in America. Gallatin was born in Geneva, Switzerland, on Jan. 29, 1761. He was the son of an established aristocratic family. He was orphaned at age nine but well cared for by his extended family. While a student at the elite Geneva Academy, Gallatin read deeply in philosophy of Jean-Jacques Rousseau and the French Physiocrats; he became dissatisfied with the traditionalism of Geneva. As a student of the Enlightenment, he believed in human nature and believed that when free from social trammels, it would display nobler qualities and achieve vaster results, not merely in the physical but also in the moral world. Thus the democratic spirit of America attracted him in 1780 at the age of 19. After time as an interpreter and partner of a speculator in western lands, in 1785 Gallatin settled on a farm in Fayette County, Pennsylvania. He was not good at land speculation or farming, but his experience on the frontier in Turnerian fashion shaped his thinking and aided his political advancement. Shedding his aristocratic heritage, Gallatin became the exemplar and spokesman of western democracy, representing it at several state conventions and in four sessions of the Pennsylvania legislature, where he framed a program enabling the state to become debt-free. He was a workhorse, serving in the session of 1791-1792 on 35 committees, preparing all their reports, and drafting all their bills. His calls for a powerful legislature and weak executive displayed his trust in the people. In May, 1789, he married Sophie Allegre, but she died a few months later; in 1793, he married Hannah Nicholson from a prominent New York City family. Gallatin was elected a U.S. senator in 1793, but was voted out of his seat by Federalist opponents on the dubious grounds that he had not been an American citizen for a full nine years. Returning home, he found western Pennsylvanians (mostly Scotch Irish) angry at the whiskey tax imposed in 1791 by Congress at the demand of Alexander Hamilton to raise money to pay the national debt. Farmers could only export whiskey because transportation costs were too high for grain. Although Gallatin had opposed the tax before it was passed and attended numerous protest meetings, he counseled moderation. Nevertheless, the role he played in the Whiskey Rebellion in the early 1790s proved a lasting political liability, as President George Washington denounced the tax protesters, called out the militia, and marched at the head of the army to put down the rebellion. A group of radicals, headed by a blatant demagogue named David Bradford, staged incendiary meetings, to which they summoned the local militia, terrorized conservatives in Pittsburgh, threatened federal revenue officers with death, and called for rebellion. Gallatin calmed the westerners : with courage and persuasive oratory, he faced the excited and armed mobs, heartened the moderates, won over the wavering, and at last secured a vote of 34 to 23 in the revolutionary committee of sixty for peaceable submission to the law of the country. The rebellion collapsed as the army moved near, Bradford fled, and there was no fighting. Gallatin's neighbors approved his advocacy of their cause and elected him to the U.S. House of Representatives for three terms, 1795-1801. There he became a leader in the Jeffersonian Republicans. By 1797, when Madison retired, Gallatin became the party leader in the House. He strongly opposed Federalist domestic programs, as well as the Jay Treaty, which he thought was a sellout to the British. When the Quasi War with France erupted in 1798 he kept a low profile, but did oppose the Alien and Sedition Acts. He was instrumental in creating the Ways and Means Committee to oversee finances. Gallatin reluctantly supported Jefferson's embargo of 1807-1808, which tried to use economic coercion to change British policies, and failed to do so. The national bank had been allowed to expire over his objections, and New England financiers refused to loan money for the war effort, so Gallatin resorted to innovative methods to finance the war. In March 1813, he initiated the public bidding system that was to characterize subsequent government borrowings. A financial syndicate subscribed for 57% of the $16,000,000 loan, of which $5,720,000 came from from New York City, $6,858,000 from Philadelphia, and $75,000 from Boston. In 1813, with Congress turned hostile, Gallatin began a long career as a diplomat by becoming minister to Russia. He was a key negotiator who secured the Treaty of Ghent on Christmas Eve, 1814, ending the war of 1812 with Britain. His patience and skill in dealing not only with the British but also with his fellow members of the American commission, including Henry Clay and John Quincy Adams, made the Treaty "the special and peculiar triumph of Mr. Gallatin." Declining another term at the Treasury, from 1816 to 1823 Gallatin served as minister to France, struggling with scant success to improve relations with the Bourbon Restoration government. He returned home in 1823 and was offered the vice presidential nomination with William Crawford in 1824, but was humiliated when the offer was withdrawn. In 1826-1827, he served as minister to the Court of St. James (Britain) and negotiated several useful agreements, such as a ten-year extension of the joint occupation of Oregon. Gallatin died on August 12, 1849 in Astoria, New York. From 1827 until his death Gallatin was a private citizen. He was president of the National Bank (later the Gallatin Bank) in New York from 1831 to 1839. He took a lively interest in politics, banking, and education, wrote prolifically on those subjects, and was a co-founder of New York University, which named its undergraduate college after him. His last great endeavor was founding the American science of ethnology, with his studies of the languages of the Native Americans; he has been called "the father of American ethnology." Founder of the American Ethnological Society in 1842, Gallatin underwrote most of the cost of its two volumes of Transactions, and wrote for them "Notes on the Semicivilized Nations of Mexico, Yucatan and Central America" and an introduction to "Hale's Indians of North-West America and Vocabularies of North America." ↑ Friendship Hill is now a national historic site. ↑ Carter Goodrich, "The Gallatin Plan after One Hundred and Fifty Years." Proceedings of the American Philosophical Society 1958 102(5): 436-441. Kuppenheimer, L. B. Albert Gallatin's Vision of Democratic Stability: An Interpretive Profile. (1996). 152 pp. This page was last modified on 27 June 2016, at 21:53.